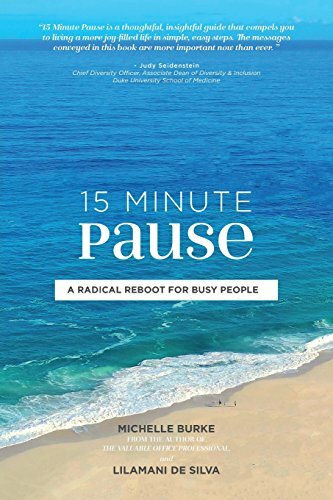 “15 Minute Pause - A Radical Reboot for Busy People” is more than a guide for creating time to restore, it is a playbook on how to live life more intently all day long. As soon as you see its soothing ocean cover, your mood will be set for contemplation. Authors Michelle Burke and Lilamani de Silva have written an in-depth analysis on how we can live life to its fullest without overworking our days. Each chapter tackles a new concept on the road to discovering a more fulfilling life. It begins with generating a greater awareness for yourself, mentally, emotionally and physically. What triggers you to conduct your life the way you do? The book’s simple layout offers tools to: analyze how you spend your day, decide what needs to change, incorporate 15-minute activities for transformation and track your weekly progress. This handbook is loaded with worksheets and assessments for readers to evaluate time spent and decide what is most important. It’s perfect for the New Year to set goals and plan for a brighter future in all areas of your life: career, social, financial, physical and community. With plenty of white space for observations and reflections, it makes a great keepsake to look back upon for future reference. Although there are a lot of different suggestions, tips and strategies, I love the authors’ underlying concept of Meddler vs. Player. They use these words to communicate the simple idea of negative vs. positive thinking. It is the backbone of the book and keeps the text grounded and purposeful. You may think that this is another manual for adding more tasks to your list. “How can I afford to spend an extra 15 minutes doing nothing?” But, the authors are effective in explaining why the “pause” is important. One of my favorite quotes in the book is “joy-filled moments don’t add more to an already busy day, rather they make the busy day better.” It’s true that when I take even a few minutes to reflect or have a cup of tea, it sets a new tone for the remainder of the day. In fact, I wholeheartedly believe that this pause should be inserted into a person’s routine more than the single 15-minute increment proposed by the authors. But, it’s definitely a good start! We all need a reminder to do self-care. “15 Minute Pause” provides us with the reasons and resources to do so easily. Incorporating time for oneself is critical to life and feeds us with the stamina and exuberance to go to work each day, take care of others, and be involved in the community. Authors, Michelle Burke & Lilamani de Silva are experts in the field of business and how to get the most joy from life. Their backgrounds involve working with Fortune 500 companies and traveling the world to observe how other cultures get it right. In a nutshell, their dual knowledge is convincing and all-encompassing. This book is a keeper - one that I will definitely be using to evaluate my “me time” as the year progresses.